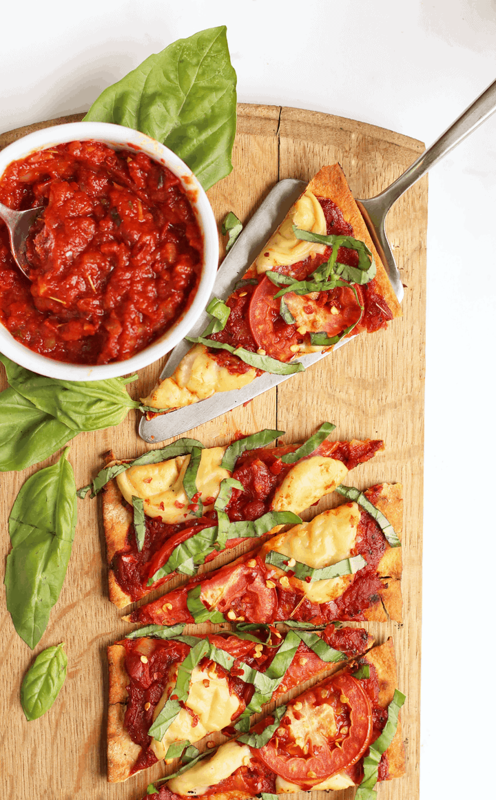 This Vegan Pizza Margherita is made with a thin crust, homemade tomato sauce, and vegan mozzarella for a delicious plant-based classic pizza. This post is sponsored by Flatout Flatbread. All opinions are 100% mine. Somehow it happened. June has arrived and with it’s arrival comes summer, weekend getaways, beach time, long nights, and hot grills. And so today, in honor of all these great things just around the corner, I bring you one of my favorite pizza recipes of all time: Grilled Vegan Pizza Margherita. I’ve been making a variation of this Pizza Margherita for many years. It started off with a pre-made sauce and store bought (vegan) mozzarella. Over time I discovered the pizza could be improved with just three simple adjustments. 1. Homemade pizza sauce. 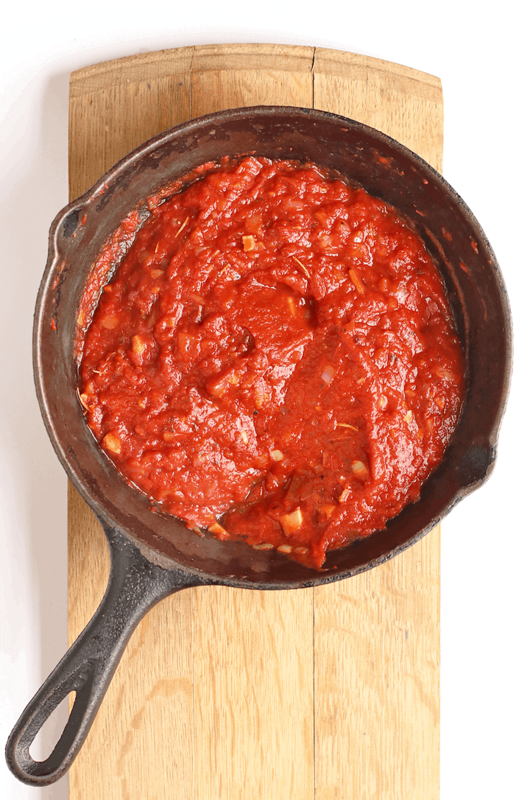 There is absolutely no good reason not to make your own pizza sauce. It can be prepped in just about 5 minutes (another 15 or so for simmering) for an affordable option that, more importantly, can be seasoned just to your liking. Pretty great, huh? 2. Homemade vegan mozzarella. There are some good readily available vegan cheeses out there, but I have yet to find one that melts the way it ought on a pizza. That’s why I suggest taking the homemade route. This cashew-based mozzarella, inspired by this recipe, is not only DELICIOUS and takes only 10 minutes to make. It is also gooey and melty and stretching and cheesy just like it ought to be. Seriously, this cheese made the pizza go from an 7 to a 10! 3. Grill, not bake. I usually bake my pizzas, but with summer just around the corner, I thought we would do a little grilling today instead. The taste of grilled pizza is far superior to that of baked. By grilling you can get a perfectly crispy crust and a wonderful smokey, charred taste of the grill; a taste that pairs delightfully with homemade pizza sauce and cashew mozzarella. 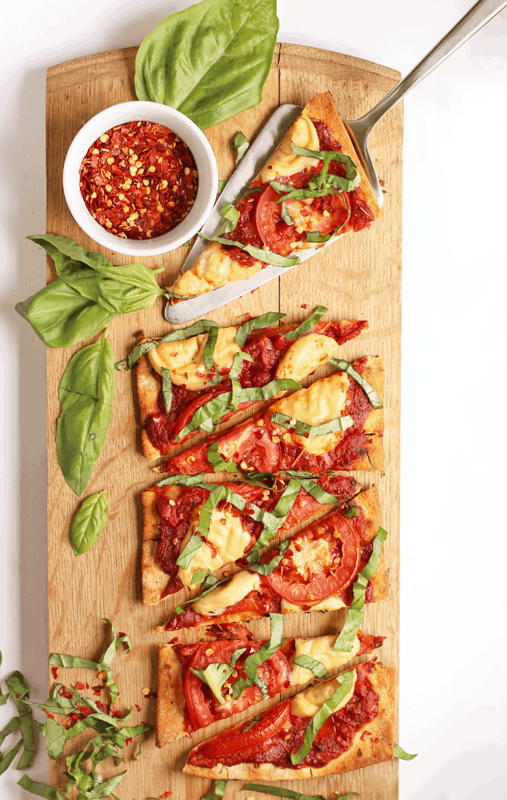 When grilling pizza, it’s traditional to cook the dough on the grill, but for this recipe I used Flatout Flatbread’s Artisan Thin Pizza Crust, making for a pizza that is cooked within minutes! I’ve been working with Flatout Flatbread for a couple months. If you are unfamiliar, they are the flatbread I used for this Green Goddess Pizza recipe. 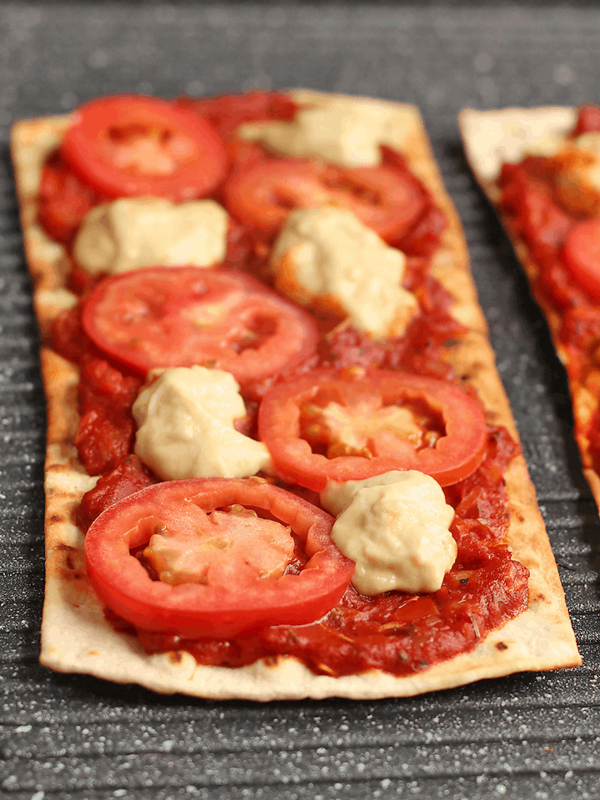 Flatout Flatbread is a great choice for those looking to eat lighter. 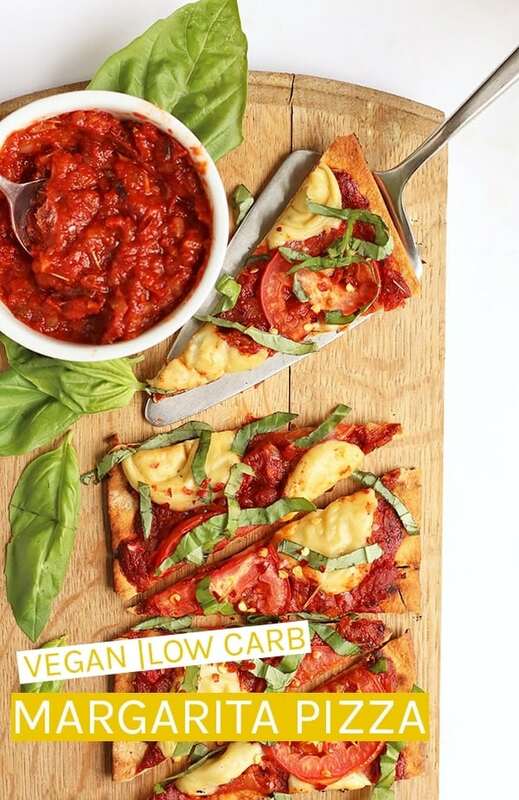 Having recently partnered with Weight Watchers, becoming Weight Watchers official flatbread, you can trust that their breads are a healthy low-calorie alternative that provides a terrific source of protein and fiber without compromising on taste. There you have it. 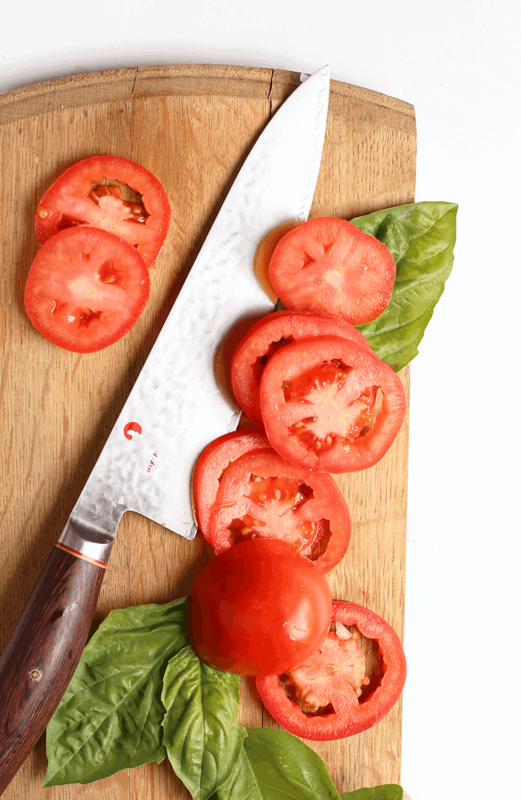 The three steps to making the perfect vegan Pizza Margherita. So, help me welcome in summer by firing up your grill and making a little pizza with me. To make the cheese, drain and rinse the cashews and place them in a high-powered blender along with the remaining mozzarella ingredients. Blend until completely smooth. Transfer to a saucepan placed over medium heat, stirring the cheese constantly. Within 1-2 minutes the cheese will start to get very thick. Keep stirring until the cheese begins to move together while stirring. Remove from heat and let cool while preparing the other ingredients. To make the sauce, heat the oil in a small sauce pan over medium heat. Add onion and garlic and sauté for 4-5 minutes. Stir in the remaining ingredients and bring to a simmer. Let simmer for 10 minutes. Meanwhile heat the grill to about 550 degrees. Brush the pizza doughs with olive oil and grill one side of the pizza for 1-2 minutes. Flip the crusts and evenly top with tomato sauce, Roma tomatoes, and spoonfuls of mozzarella. Put the lid on the grill and cook for about 3 more minutes. The pizza is done when the edges are crisp and dark. Remove from grill, top with basil and red pepper flakes and serve immediately. No grill? No problem! Bake this pizza at 450 degrees F. for about 10 minutes until crust is crispy and brown. My daughter and I made this but we couldn’t find the Flatout flat bread Pizzas so we used regular pizza dough. The sauce was delicious but we had a problem with the consistency of the cheese. The recipe called for soaking the cashews in hot water, which we did. But then when we added everything to the blender it would not really blend, just jump around. We were unclear if we should add the 1 cup of hot water that was the next ingredient to the blender, so we added a little. The cheese turned out very runny, not thick like it should have, so I guess we should not have added the water, but the recipe didn’t say if the water was to soak the cashews or add to the blender. Anyway, we will try again because it was yummy. Hey Sharon, sorry you had some problems with the cheese. The water is part of the cheese ingredients, as it is listed. It should be blended with the other ingredients. After blending did you then transfer the cheese to a saucepan and cook it until thick and cheesey? If you cooked it and it was still runny, just cook it a little longer until it is the texture of melted mozzarella. Based on your comment though, it seems as though that step was skipped, which is probably the reason you weren’t able to get the right consistency. Oh yum, we love grilling pizza! This looks amazing—so fresh! I am all about pizza on the grill. Nothing beats that bit of char on the crust. I love the perfect simplicity of the ingredients here – you really let each one shine! This looks phenomenal! I would eat that whole thing! What a beautiful flabread! Love how it looks and your recipe sounds delicious! My husband loves Margherita pizza! I just love pizza, lol. This looks delicious and I love how much red sauce you put on it! June, I know. What? But yay summer! This pizza looks great! My biggest problem with vegan pizza is finding a cheese I like. Thanks for the recipe. I’ll try it! I agree that vegan cheese can be a struggle on pizza. Let me know what you think! 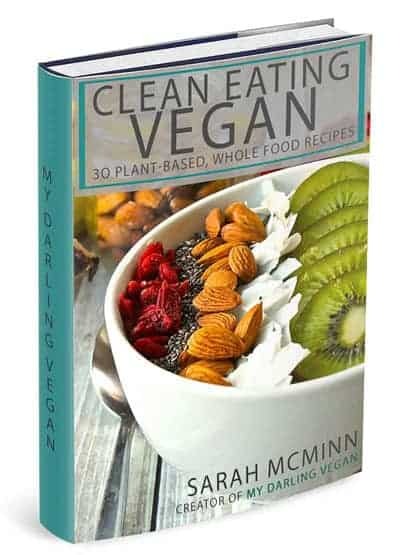 Looks amazing, Sarah! I love thin crust pizza, and grilling it is such a great idea! Thin crust is the best, isn’t it?! Oh YUM! I love margherita pizza, and grilling sounds like it would make it extra delicious. Perfectly fresh and wonderful for a summer pizza! I LOVE grilling pizzas and it adds such a great smoky flavor! 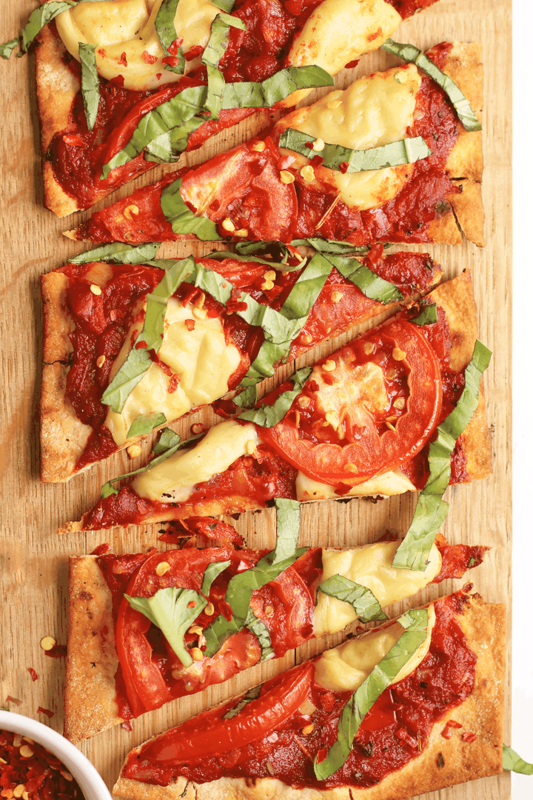 Grilling pizza is a great idea and the Flatout flatbread makes it look super yummy, easy and mess free. My kind of meal! For the vegan mozzarella is that 1/2 cup cashews? This recipe sounds amazing! Totally making this weekend! Yes. Thanks for pointing that out. I fixed it on the recipe. I have NO IDEA how June got here. We’ve already pulled out the grill, and every year, we say we’re going to grill a pizza, but we never do. I’m going to print this recipe out and make it happen!